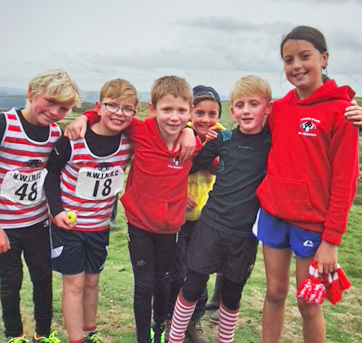 The sun was shining on the CVFR juniors who made the trip to North Yorkshire on Sunday for the English School Fell Running Championship. Hosted by Giggleswick School, in North Yorkshire, the forecast had been for rain and lots of it. Fortunately this did not materialise. Four hundred runners representing schools across the country were scheduled to take part throughout the day in four races organised by year group. This steep and challenging course is designed to be ‘varied and technical’. In stunning conditions, the championships started with the Y7s 2.7k route with 130m ascent, culminating in the final race of the day, Y12/13 running 6.4k with 276m climb. CVFR Year 7 boys put in fantastic performances to win 2nd prize for Calder High School – Charlie Pickens (7th), George McPhee (9th), Tom Owen (11th), and Seth Howson (37th). Ilkley took first School. Calder Valley’s Will Hall finished 8th in the Year 8/9 race, contributing to the silver medal for his school, Stoneyhurst. Joe Hobbs (Calder High) and James Duffy (Crossley Heath) also ran well finishing 16th and 23rd respectively. 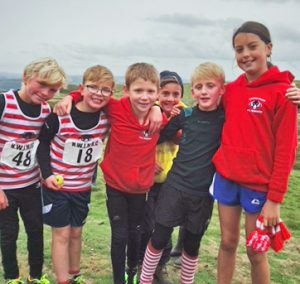 Whilst many of the older members saved themselves for the English Schools Fell Running Championships on Sunday, a hardy troop of juniors tackled this deceivingly tough race on Saturday in the beautiful setting of the Great Orme in Llandudno. Harry Cliffe looked assured throughout and came home with the silver trophy. Ted Parker not far behind securing a solid top ten finish. Ollie Pickens ran a storming race in the U11s, leading for a while but kept battling to get 4th boy with Wynn Standish getting a hard fought for 8th. Fearne Hanson ran a hard and brave race to come home with 6th girl.